There are so many wonderful ideas using crayons to create memorable art pieces. The image below is a gift from my self-described “I don’t like art” teenager for Mother’s Day a few years ago. 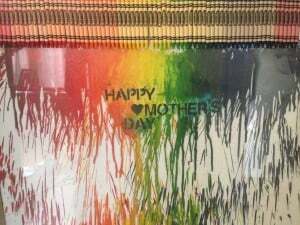 He used a stencil and spray painted ” Happy Mother’s Day” He glued a set of crayons onto a bristol board and used a hairdryer to melt the crayons. I love it so much. He planned and executed an art project. Its worth so much more than a box of chocolates. 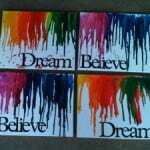 A quick search on Pinterest for ‘melted crayon art’ will give you a plethora of ideas. Here are a few ideas. 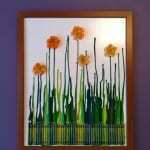 Looking for a crayon resist Father’s Day project, check this out.